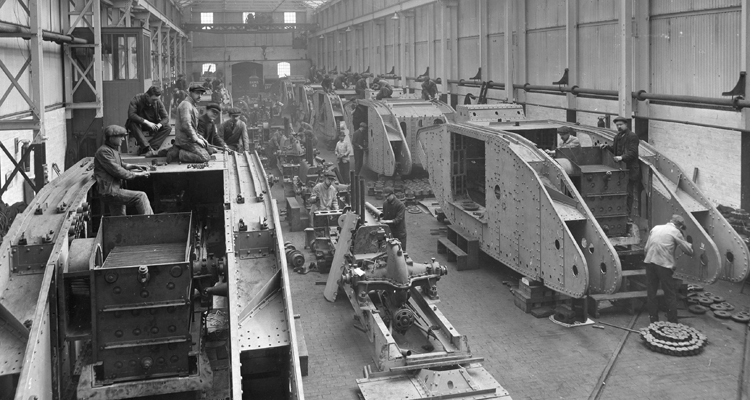 The Government needed to both reduce borrowing and raise funding for the war effort. 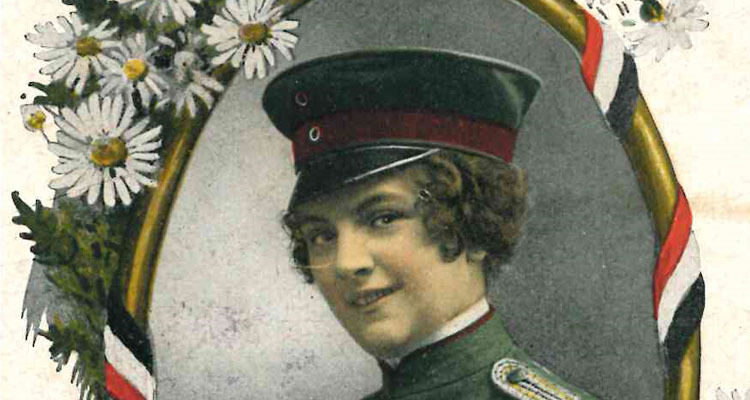 In response to this, in 1916, the National War Savings Committee was formed. The aim of this Committee was to promote the merits of being thrifty and to encourage the purchase of War Savings Certificates and War Bonds. A certificate could be bought for 15 shillings and 6 pence and redeemed 5 years later for 1 pound. 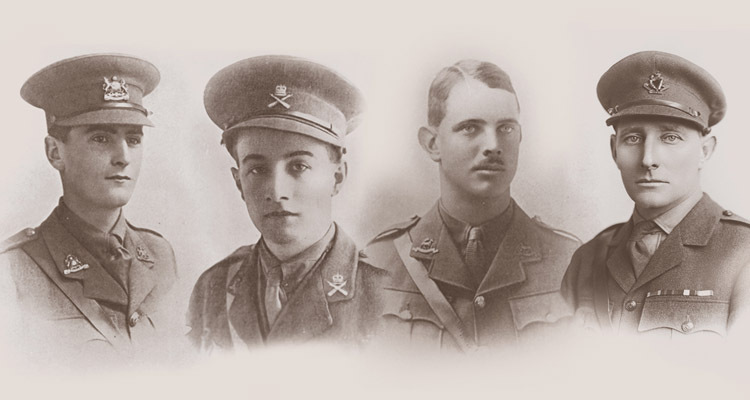 In order to increase public interest in the savings scheme, and following the success of the Tank Corps at Cambrai in November 1917, it was arranged for six tanks to tour the country acting as banks from which War Bonds and Certificates could be bought. The tanks spent a week at a time in different towns and cities across Britain where local politicians, heroes and celebrities would perform and address the crowd from on top of the tank. The spectacle drew vast crowds and provided a much needed boost to funding. As a result of the success of the Tank Banks and the public marvel and enamour with the new weapon many souvenirs were produced to commemorate the campaign. 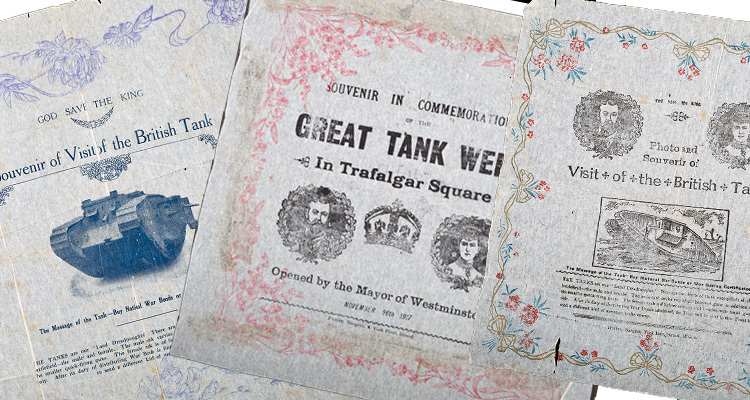 The wealth of souvenirs produced shows just how momentous the visit of one of these tanks to towns and cities across the country would have been. The campaign itself raised millions of pounds for the war effort and was considered a great success. A selection of china model tanks from The Tank Museum collection. Introduced at the turn of the century, crested china was popular as souvenir and collectors’ items. Each piece bore the coat of arms of the place where it was sold. 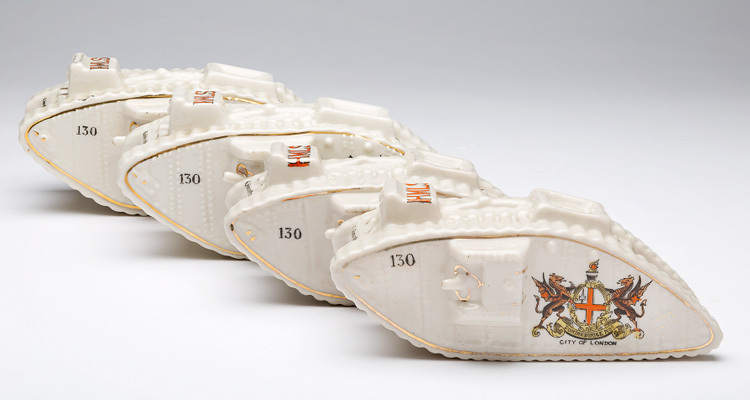 With the onset of First World War the china models were influenced by topical events. Models included bombs and shells, people involved in War work and ships and aeroplanes. 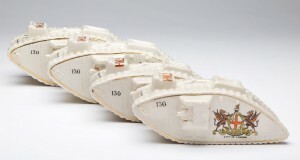 After the Tank Corps success at Cambrai and the popularity of the Tank Banks, crested china tanks were soon being produced bearing the name of the tank and often an inscription. The china tanks pictured here all bear the crest of the town in which they were sold and those numbered ‘130’ commemorate the Tank Banks. 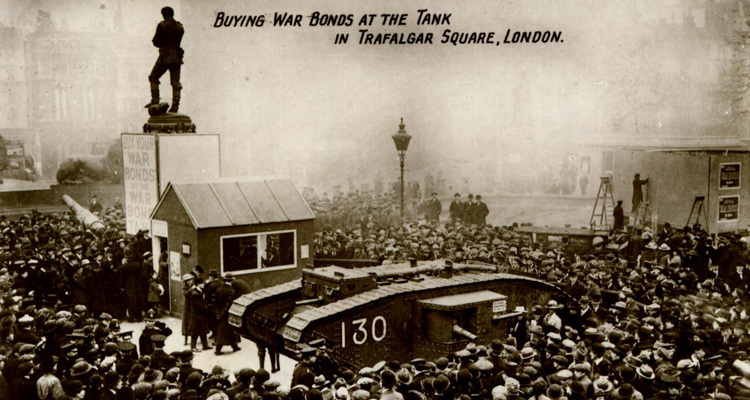 This is after Tank 130 ‘Nelson’ which started its fundraising week in Trafalgar Square, December 1917. 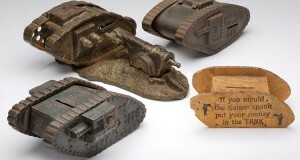 A selection of Tank money boxes from The Tank Museum collection. To encourage the collection of funds for the war effort money boxes produced during the First World War often took the form of a Tank Bank. The tanks here numbered ‘119’ are modelled on the Mark IV Male Tank ‘Old Bill’. 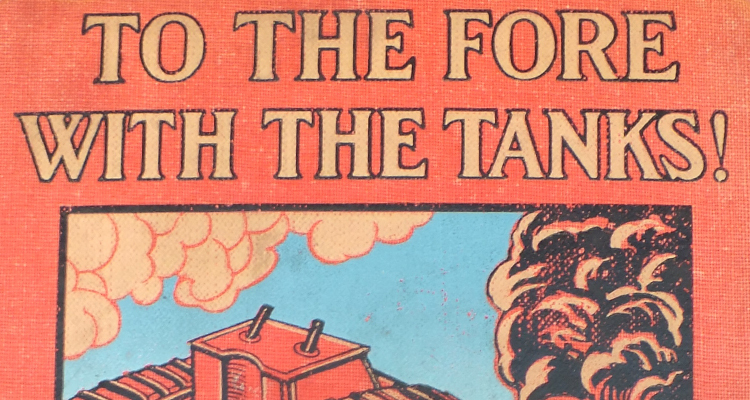 This tank was sent to Birmingham in December 1917 to promote the sale of War Bonds and Savings Certificates. These fine tissue paper napkins have survived unbelievably well. 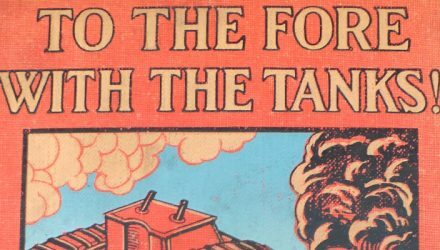 They were produced to advertise the arrival of the Tank Banks, promote the National War Savings campaign and encourage enthusiasm amongst the crowds over the great new invention of the tank. Although a souvenir of the event they are, by their nature, a throwaway, perishable item, making it even more incredible that they have endured.